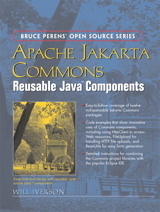 The Apache Jakarta Commons project is a collection of freely-reusable, opensource Java components. Commons components are used in a wide variety ofprojects, including Apache Tomcat, Hibernate, and many other commercialand open source projects. This book is a Java developer's guide to the Apache Jakarta Commons project.It covers in detail the twelve most important Commons packages, with sampleprogram code provided for each. Included are a number of remarkably usefulideas for working the various Commons packages, such as using HttpClient toaccess web resources, File Upload for handling HTTP file upload, BeanUtilsfor easy form generation, implementations of various protocols such as FTP and NNTP, and building a command line tool to search for the location ofclasses on the class path.Also included are detailed instructions for combining the Commons projectlibraries with the popular Eclipse IDE. Plus, the book includes a handy 75-page Jakarta Commons quick reference Appendix.